In 1118 in the Holy Land a military order of warrior monks was founded by the name of The Poor Knights of Christ and of the Temple of Solomon, subsequently to be commonly known as Order of the Knights Templar. Their motto was: Non Nobis Domine, Non Nobis, Sed Nomini Tuo Da Gloriam (Not to us, o Lord, not to us, but to Your name give glory). The noblemen, consecrated into Templar knighthood, took the three monk vows of poverty, chastity and obedience, as well as a fourth one – to patrol and protect the pilgrims to Jerusalem with the power of their weapons. This brotherhood of armed men, with a lifestyle based solely on the use of weaponry and privileges, became famous for drinking huge volumes of red wine, which gave rise to the French proverb “Drinks like a Templar”. In 1146 the Knights Templar adopted the famous scarlet splayed cross as the symbol on their black-and-white battle banner, called Beau-Séant, and the same was their battle cry. In medieval French the meaning of “beau” (beautiful) was associated with the notion of lofty spirit, nobleness and high morality, hence the meaning of the battle cry - "Be Glorious". 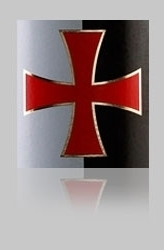 This is a special collection of wines, produced and bottled by appointment and licence under the control of Ordo Supremus Militaris Templi Hierosolymitani – Magnus Prioratus Magistralis Bulgariae.